CCFF’s HOUSE OF MORE is a video art exhibition including immersive experiences and live electronic and experimental performances featuring emerging artists. Free and open to all 1:00 – 11:00 PM. Live performances by River Spirit and Mel N beginning at 7:00 PM. River Spirit has been active in the Detroit music scene since 2010. Their music has been featured on Audiofemme, Detroit Music Mag, Grand Circus Mag/ She Shreds, and Afro Punk. “Hailing from Detroit, a city where musical movements are born on the regular, River Spirit cross lines no-one else had even noticed were intersecting. Their new single “Me I Fall” bares traces of jazz-punk, Oakland Afropop, math-rock, and a little classic R&B for good measure. Jagged riffs vie for space with Vanessa Reynolds’s plaintive, expansive melodies. It’s haunting one moment and riveting in the next…” – Afropunk. After spending a few years testing their ideas around Detroit, River Spirit has delivered their full-length debut “Me I Fall”, available on all streaming platforms January 25th 2019. Moving seamlessly through pop genres, the album has a sound that is refined. The songs are short and compact, filled with sharp corners and hooks. Thematically the album explores what it means to fall apart and what can be created when we allow ourselves to be vulnerable enough to unravel; spaces of transition, the feeling of being submerged, literally and metaphorically. 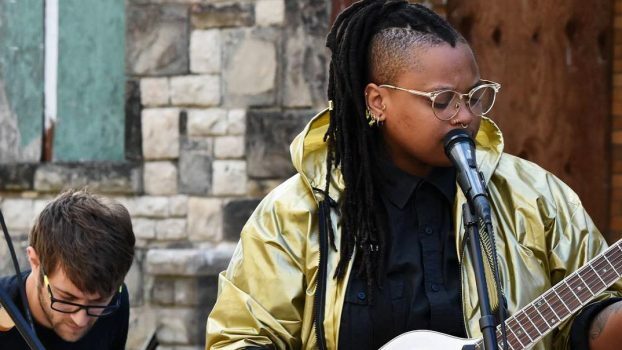 Me I Fall is Written and Performed by River Spirit; Additional Upright Bass by Betsy Soukup; Juanita Reynolds and Cynthia Burton Backing Vocals; Recorded, Mixed, and Mastered in Detroit by Scott Murphy (Atonuv). MEL*N is Mel Lynn from Grand Rapids, MI. Confessional lyrics packaged into poppy hooks over bright synths and 4/4 drum machine beats, it’s dance music for the self-aware.